Instead of shoveling snow on Christmas, entertaining the in-laws at Hanukkah or unsuccessfully looking for a party on New Year's, you could be drinking eggnog poolside, singing carols on deck, eating multicourse holiday meals prepared by professional chefs and enjoying New Year's Eve with enthusiasm (and with no worries about driving home). That's right. You could be celebrating on a relaxing, warm-weather cruise. Cruising during the holidays can be a great way to celebrate and spend time with family, but you'll have a better experience if you put a little effort into planning the right cruise and setting the right expectations. From booking tips to packing advice and information on what to expect onboard and off, here's everything you need to know about taking a holiday cruise. Be prepared to spend more. Christmas and New Year's holiday cruises are often the most expensive of the year. Cabins at this time are in high demand because schools are on break, and many families want to take vacations during these weeks. However, some lines do offer flash sales or loyalty club promotions, so check cruise line websites, sign up for email newsletters and reach out to a cruise travel agent to find out about specials. Book early, especially for specialty cabins. If you want to lock in your preferred itinerary, ship, cabin and dining group and have as much time as possible to look for affordable airfare, book early (at least nine to 12 months in advance). If you have your heart set on a specific cabin or suite, you might want to reserve your room as soon as bookings open for your itinerary. Check out Wave Season sales from January through March for added perks, like a free beverage package or shore tours, that will help bring down the total trip cost. Don't forget about flights. When booking airfare, remember that flights at this time of the year can be outrageously pricy and often are oversold. Try to reserve your flights early, or consider the cruise line's air/sea package. You might even want to choose a cruise departing from a nearby homeport so you can avoid flying altogether. Another tip: At this time of year, it's a very good idea to fly into your departure city a day early. With flights so crowded, a delay or cancellation due to weather or overbooking might cause you to miss your cruise. There's no guarantee you'll get on the next flight out if there's a problem with yours. Decide where you want to celebrate Christmas. 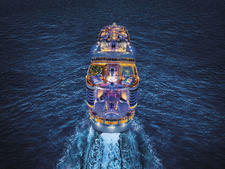 Do you want to spend Christmas Day on the cruise ship or in port? Ships on a regular weekly schedule are likely to maintain their normal itineraries, so you may end up in a port on Christmas Day when everything's closed but the church and the beach -- and you might feel cheated out of a port stop. On the other hand, there might be local festivities you can attend that could lead to a wonderful cultural experience. On the flip side, you might prefer a leisurely day at sea to celebrate with loved ones and take advantage of shipboard activities. Choose your itinerary accordingly. Pack festively. 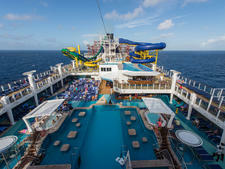 Packing for a holiday cruise can be a little different from packing for a regular cruise. What should you wear on a Christmas cruise? For Christmas and New Year's Eve, you might want special holiday outfits or tuxes and party dresses if the festivities fall on formal night. In addition, you might consider accessories like Santa hats, reindeer antler headbands, party hats, colorful beads, holiday-themed T-shirts or other festive items you might want to wear. Families and large groups might want to get into the spirit by printing up matching T-shirts or hats to wear onboard. Bring decorations. For Christmas or Hanukkah, consider decorating your cabin to get in the holiday spirit. Creative cruisers have been known to decorate cabin doors with wreaths, holiday cards and photos. To spruce up your cabin's interior, pack a small artificial tree (disassemble it for easy packing), electric menorah (you can't light candles in your cabin), strings of lights, inflatable decorations and stockings. Don't forget (unwrapped) gifts. Definitely bring travel-friendly presents to exchange on Christmas or Hanukkah. However, if you're flying to your homeport, leave them unwrapped, and pack some gift bags, tissue paper and ribbons to doll them up once onboard. Airport security might ask to open wrapped packages to make sure they're not concealing something. BYO bubbly. For New Year's, you might want to bring your favorite bottle of Champagne or sparkling wine onboard. Just check your cruise line's alcohol policy to make sure ship's security won't take your beverage from you when you try to board. You might have to pay a corkage fee, especially if you're planning to take your bottle to an onboard restaurant. Seek out seasonal food and drink. Cruise lines go all-out for the holidays, especially in the food and beverage department. 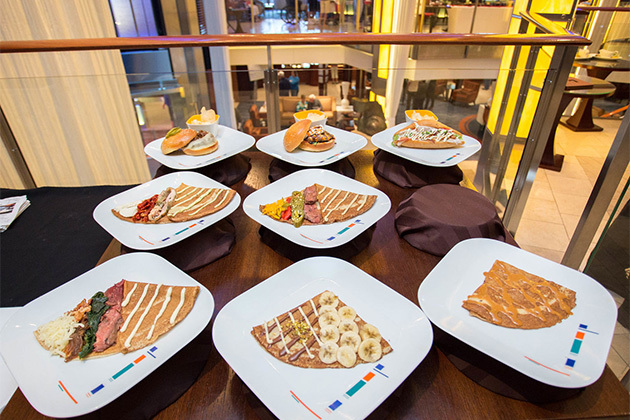 The ships' restaurants will offer holiday menus with seasonal favorites: turkey with cranberry sauce for Thanksgiving, potato pancakes and jelly doughnuts for Hanukkah, roast turkey or ham on Christmas (with eggnog to drink) and fancy dinners and late-night snacks for New Year's Eve. Look for fun themed cocktails at the bars, too. Check your daily newsletter for holiday-themed activities. Your cruise line's entertainment staff will plan special activities to celebrate the holidays. Passengers can enjoy special performances by the ships' entertainment staff and special guests, caroling, tree- and menorah-lighting ceremonies and seasonal movies shown on in-room TVs and onboard movie screens. (And don't forget the holiday football games shown in your ship's sports bar or big screen.) There might be seasonal craft-making or cooking classes. Kids can count on visits from Santa, arts and crafts, and storytelling. You don't have to skip religious services. Some cruise lines bring priests, rabbis or ministers onboard to lead services and interact with passengers during Christmas and Hanukkah. Look for a midnight mass on Christmas and nightly candle-lighting during Hanukkah. If you don't see anything on the schedule, ask at Reception if you can gather together interested passengers for a lay-led service. Prepare to party. Cruise ships go all-out with their New Year's Eve bashes. You can expect Champagne toasts, countdowns to midnight and possibly a balloon drop. 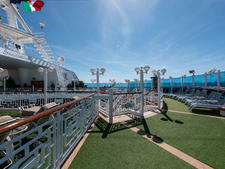 Weather permitting, parties might take place on deck. Consider buying gifts onboard. Take a look at the onboard shops and check out advertised sales to find a cruise-themed gift, a cute handbag or special pair of glittery earrings to give your holiday outfit a boost. A spa treatment or fancy dinner in an extra-free restaurant can make lovely presents if you don't want to pack extra things in your suitcase. Your ship's professional photographers will offer the opportunity to take the perfect family photo -- which can also make great gifts for family back home. Be prepared for crowds and kids. 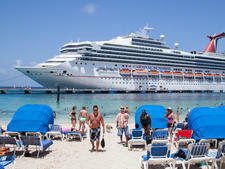 Several large cruise lines confirm ships in their fleet are at their highest occupancy during winter break. Kids clubs can get especially crowded, and some age groups might get bumped from the cool kids facilities into other lounges around the ship. Expect more queues at dinner, to get off the ship or to get into the theater at showtime. A little patience will stand you in good stead. Beware of closed-up ports. Many stores, restaurants and attractions shut down on Christmas Day (and sometimes Boxing Day on December 26), or have reduced open hours. It's a good day to book a ship-sponsored excursion or plan a low-key beach day. If you're interested in a specific venue, it's best to confirm its Christmas hours before you depart for your cruise.